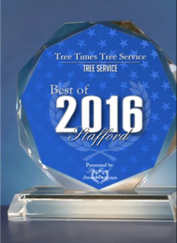 Misconception #5 - Tree Times Inc.
One tree service and its methods are just as good as another’s. That would make it easy and simple, but it just isn’t true. In Virginia, there is no requirement to be met before one can claim to be a professional arborist. It seems that if you can spell it, you can claim to be one. A professional arborist is generally recognized if he or she is certified by the International Society of Arboriculture (ISA). In many ways, the ISA certificate is like a degree in tree care. Also, you should ask about your tree contractor’s knowledge of nationally recognized pruning standards, A-300. You may even request a copy. If company seems unfamiliar familiar with these standards, you probably want to look elsewhere. Bad pruning and over-pruning (such as tree topping) kills more trees than any other tree care mistakes. Improper fertilization or pruning too much or at the wrong time can also make trees need pruning more often and lead to an increase in insects. Once you’re satisfied that you’re working with an honest, competent professional, invite him or her to your home and get a quote. A written quotation gives you the assurance of exactly what your job will cost-no surprises. Beware of “job estimates.” They can go up. One of the most common scams is to simply print “insured” on a business card or newspaper and not actually have insurance. Ask every business to provide you with a certificate of insurance from their insurance company and you will be surprised at how many will not have any, or will only have general liability and no more. You have heard about businesses getting scammed by a new employee who suffers a severe back injury while picking up a piece of paper the first day of work. The company is forced to give workers’ comp and pay for lost wages, etc. unless it can prove that the injury was preexisting. The same thing can happen to you if you hire an unscrupulous tree contractor. You may have to prove that a ridiculous injury did not occur while he was working on your property. This can be nearly impossible to do, and you may end up paying the medical bills for someone who got injured in on a ski trip.